London Day 4 January 18, 2015 · 15 min. readThis article may contain affiliate links. I woke up at 6:30 today. I had no reason to and my alarm wasn't going to go off for another 2 and half hours. I guess the past 12 days had set my biological clock for me. And so, I rolled over and fell back asleep. I woke up at 9 and by 10:30 I was walking out of my hotel. I walked to Pret A Manger again, and had exactly what I had last time I was in London -- a ham and egg bloomer, a bowl of fruit and a can or sparkling orange juice ("With Absolutely No Nasties"). It seems almost unreal how much has changed since I last ate here -- how much I saw, and did and learned, and the people I met and lived with for 2 weeks. It seems like it was all a dream. It almost seems like it never even happened. 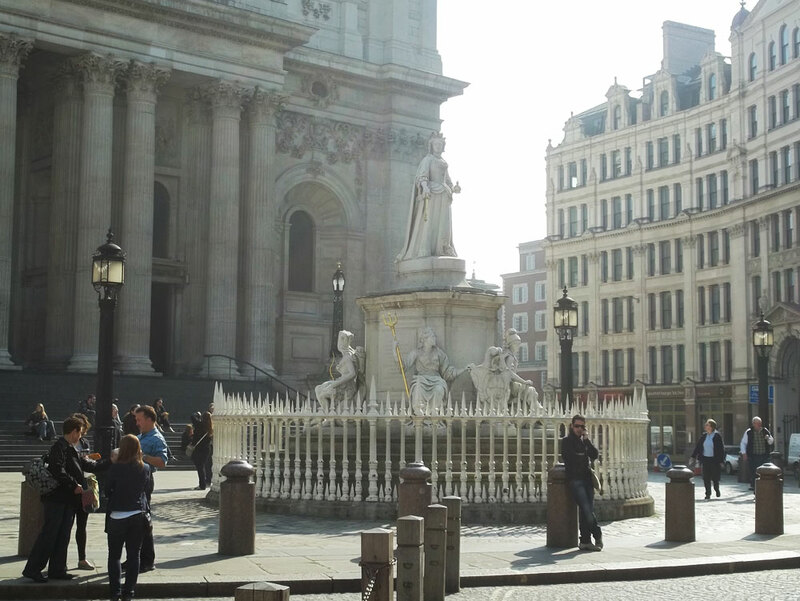 Once my breakfast was over I took out my map and saw that I was just a 30 minute walk from St. Paul's Cathedral. Since last time I was in London I was unable to go to St. Paul's because two stupid flower ladies got £40 off me "for the children", I was going to make sure I got there today. As well, because I didn't get inside the "most beautiful church in Europe" while in Rome, I was more determined than ever to go to the 2nd most beautiful church! As I walked towards it, I became conscious of the air-quality. 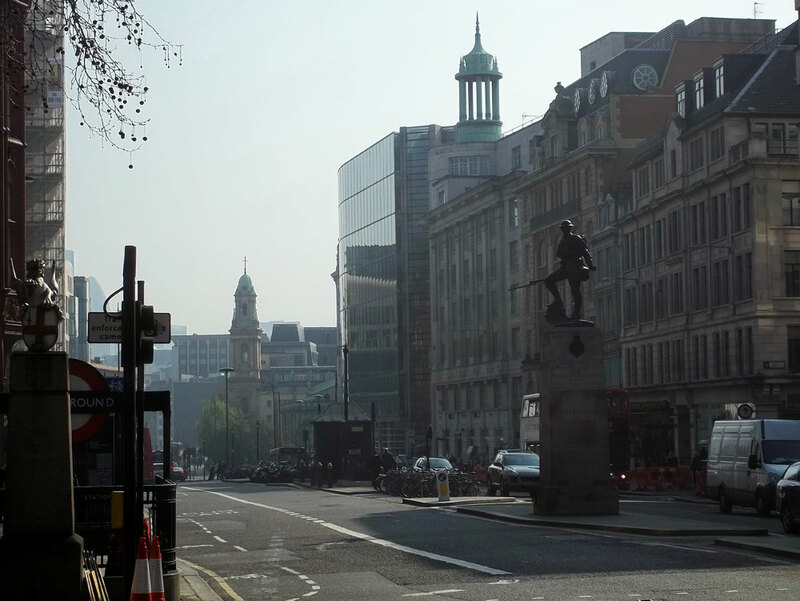 Much like in Paris, London today also had smog. It bugged my eyes a bit but it wasn't nearly as bad as it was in Paris. I arrived at St. Paul's and was shocked to see very few people around the church. Last time I was here, there were hundreds of small British children crawling all over the stairs and fountains. Today there was only the odd couple strolling past. I took a few pictures of the church and then walked in through the main-door. Entry to the church is free if you want to pray, but if you want to take a tour it'll cost you £17. I thought that was a bit much, but I realized later that I had spent over 2 hours inside the church and that it was a pretty good deal for the amount of things to do in there. 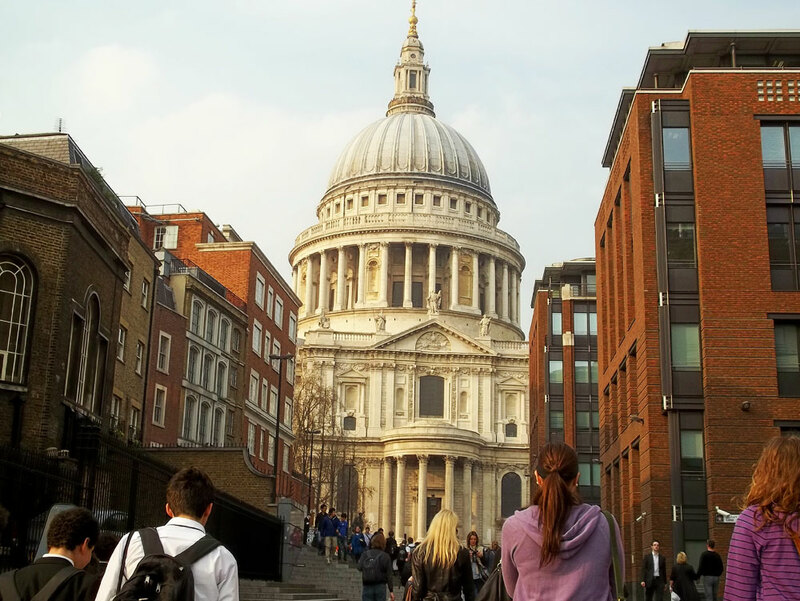 At first glance, St. Paul's looks like many other massive cathedrals speckling Europe; gold, black oak and white marble, twisting and turning up to gorgeous stained-glass windows and beautiful mosaics of Jesus and Paul on the dome and walls. 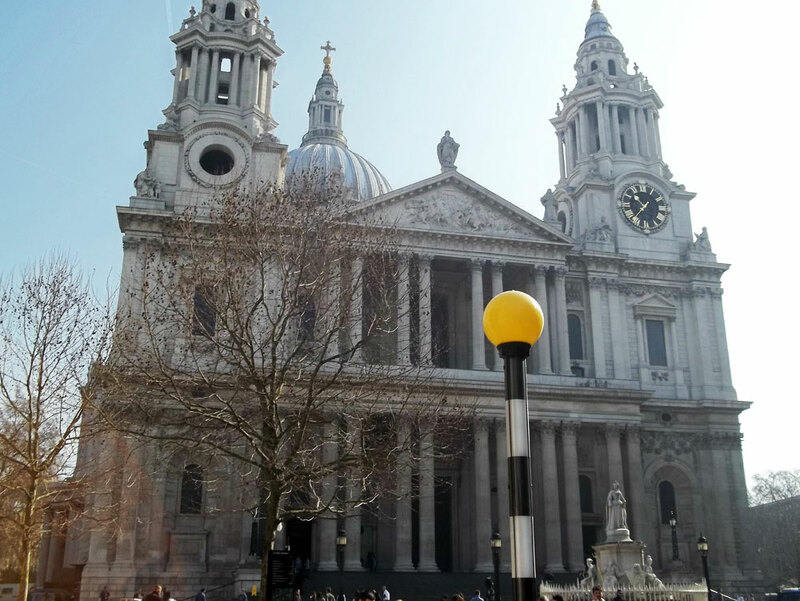 However, with my entry ticket, I also got a complimentary electronic tour guide and realized that, along with being a beautiful church, St. Paul's is also the heart and love of the City of London and the United Kingdom as a whole. Ever since it's initial construction in 604 CE, the church has seen everything from plagues, small fires, the Great Fire, animal housing (it was once used as a barn), pollution cleansing, the German Blitz, a royal wedding, many royal funerals, a service for the victims of 9/11, a service for the 2005 subways bombings and several massive reconstructions. Also, although the church is Protestant, it openly welcomes Muslim preachers to teach there to promote a "unity of religions". They also welcome people from all different religions into their church, which is really neat, and I personally believe the way all churches should be. Starting at the Baptismal Front, I walked up to the Nave (which is where the congregation sits) and then to the Dome. The Dome has paintings of St. Paul's life from when he was converted on the Road to Damascus by Jesus, to a few years later when he preached to the Romans about the Holy Spirit, and finally, when he died. Beyond the Dome is the Quire. The Quire is where the choir sits. The seats here are made out of massive black oak that have been delicately carved. Above it are 3 paintings, each made of glass. They each show different scenes from Genesis. The first shows the creation of plants, the second for the creation of birds and fish, and the third for the creation of animals. His greatest creation -- man -- sits below them and sings to God and his creation, instead of to the congregation as most churches do. Around the whole church are statues of ancient peoples, Renaissance poets, converted disbelievers and of course, Mary. There are old statues, but also one odd-looking contemporary piece, which helps spread the message that God is with us throughout all ages, including the current one. After I was done on the main-floor, I climbed the 257 stairs (which was nothing after the Eiffel Tower!) to the Whispering Gallery. They say if you place your face against the wall and whisper, your voice will travel all the way around the dome and return to somebody waiting on the other side, clearly audible. I had nobody to try that with, but I watched a mother and daughter try it and judging by their expressions, it apparently works. 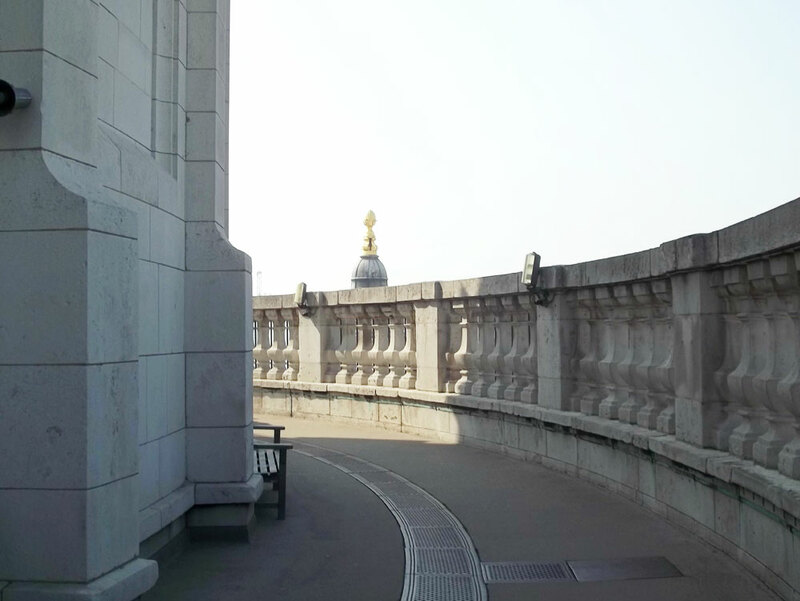 I then climbed another 121 stairs to the Stone Gallery, where you could go outside and see London. The smog was still visible, but I could still make out Tower Bridge, Millennium Bridge and the London Eye from my location. I then climbed 152 more stairs, and after squeezing through a very small doorway, I got to the top of St. Paul's Cathedral; the Golden Gallery. The sight from here was spectacular, even with the smog. Once I was done taking pictures, I had to head back down the 530 steps back down to the Cathedral Floor. As I reached the bottom, the 12:30 service was going on and I sat down and watched it for a while. I then -- very quietly -- walked to the door and down into the Crypt. The Crypt is the same size as the Cathedral and has the tombs of artists, architects, royalty, soldiers and "ordinary people" in it. It also had the Oculus in it, which was a massive theater where you could stand and watch 7 short films about the Cathedral's history. I watched all 7. I then headed towards the food-court and had to hand in my virtual guide. I wasn't comfortable eating a sandwich surrounded by tombs and graves, so I just had a small orange juice and left. 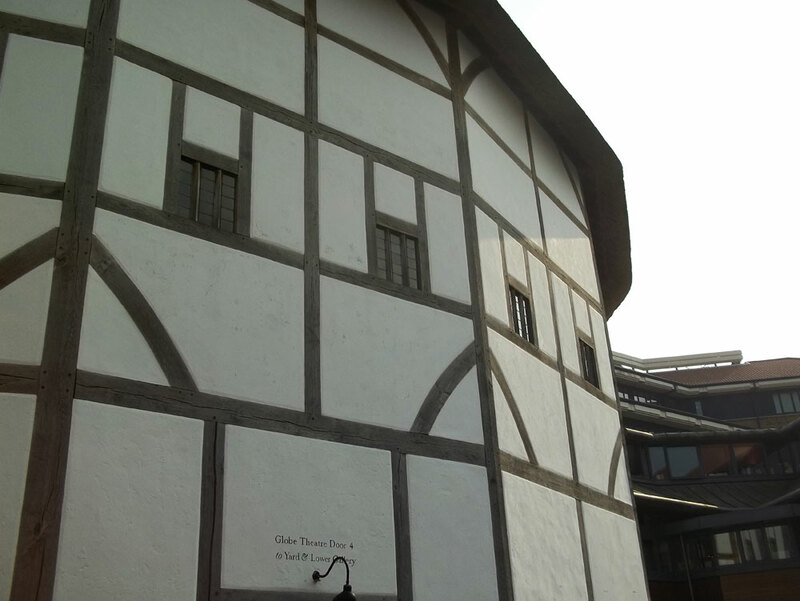 I then walked down the street and crossed Millennium Bridge -- a foot-bridge that crosses the Thames -- and arrived at Shakespeare's Globe. 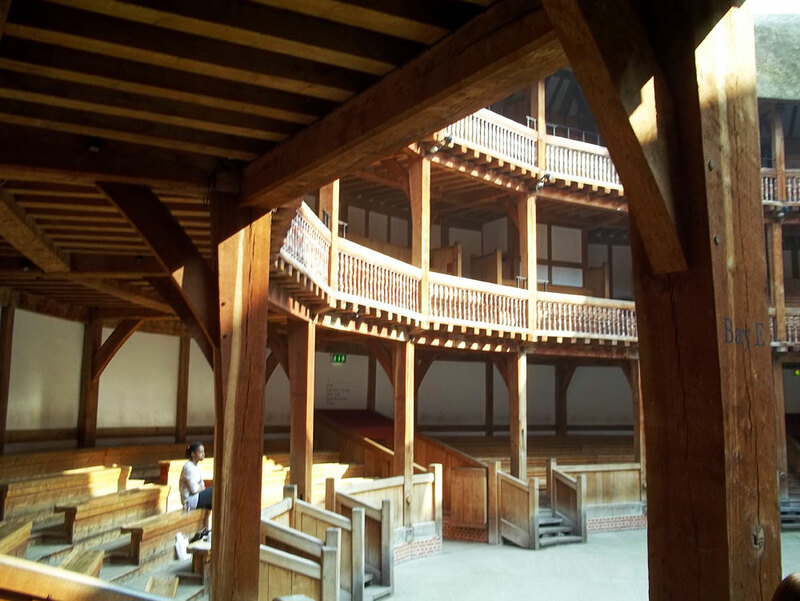 I paid £11.50 to get in and got another tour -- this time by a real person -- of the Globe. I got told I could donate £300 to get my name engraved onto the stones surrounding the Globe, but I declined. 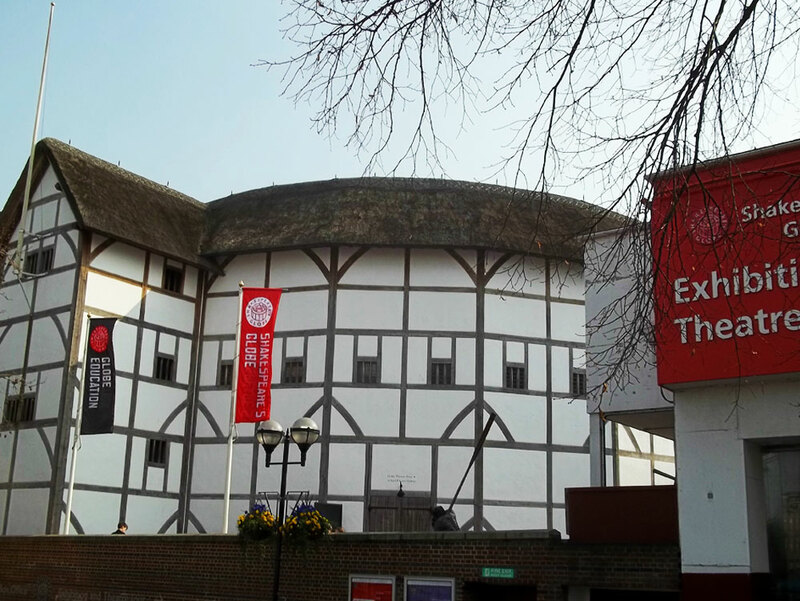 We were then told that the Globe isn't the same as it was back in Shakespeare's day because the land where the original Globe stood now has condos on it. However, this is the closest possible location to where it once stood, and was built as identical as possible -- minus the dirt floor. This new Globe used to have a dirt floor, actually, but it got too dusty in the summer and too muddy in the winter. Also, this Globe holds about half the capacity of the original Globe. I heard one tour guide tell his group that because there were American actors practicing inside, they weren't allowed to take pictures. Ours never told us that, however, so I snapped a dozen or two. The tour ended at the gift-shop where we were told we could buy our own York skull if we wanted to. Instead, I bought an "Out damn spot, out I say!" tea-towel. It cost me £8, but I only had £7.26. I had to use my Visa then, which was one of the only three times I used it (once to enter the Vatican because they didn't take €50 bills, and once to buy some CHF in Lucerne). But, for some reason, my Visa didn't work. The man at the counter said their Visa had been acting funny all day so I told him I'd be right back and went and found an ATM a few blocks down. I withdrew £20, came back to the store and bought the tea-towel. I then began my walk back home. While walking I remembered that the Contiki basement was now open, so I went there instead. Once there, I quizzed the woman working (who was also the same woman who came onto our coach the previous day and told us the basement was open) on how to get from Imperial Hotel to Gatwick airport tomorrow. She was very helpful and gave me a map with directions on it. As terrible as the accidental 2-hour ride around London was when I first arrived from Canada, it would be much more terrible if I happened to miss my plane home because of it. Once back outside, I decided to go inside the Royal National and use the public computers there to check my Facebook. I paid £1 for 15 minutes and, about a minute in, I heard somebody call my name. Just like in Lucerne and Paris when somebody called me, I immediately stopped what I was doing instantly and looked around. It was Emma and Hannah from my tour group. Both of them had gotten a Working Visa before they arrived in London and wanted to spend a few years here instead of back in Australia. They had just got back from applying for jobs. While I was talking to them, my old roommate Ralph also joined us. He asked if I wanted to join them for supper at Nando's again. His English wasn't the best, so I though he was inviting me out for supper with him, Emma and Hannah, but it was actually just him and I. We got to Nanodo's and talked about the Europe trip and what kind of lives we were going back to when we got home. He said he was going back to school in Brazil. While there, I had a double chicken burger and he had a chicken wrap. Nando's only sells chicken. We went back to the Royal National and say goodbye for the last time. We never did meet up with Emma or Hannah again. It's 8:15 now and I may read until 9:30 or 10. I'll also pack sometime tonight for tomorrow. I'm leaving the hotel at 6 AM tomorrow. Let's hope my biological clock doesn't re-set itself and make me miss my plane! This will (hopefully!) be my last entry from Europe. I hope you had fun reading this. I know I sure had fun living it! Goodnight now. Talk to you later!